Hello! We are all doing very well! We are so happy about our successful summit of Chimborazo yesterday! Today we are in Baños. We spent the day driving around, sightseeing and visiting the breathtaking waterfalls around the city. I wanted to say that Estalin was a fantastic guide and great person to have show us around the cities as well as the mountains. This will be our last dispatch, as we are on our way to Quito now and will be departing heading home tomorrow. Thank you for a wonderful expedition! I wanted to call and let you know today’s climb went great! Today we had our last day on the mountain, and it was a great day. The whole group was able to reach the Whymper Peak Summit on Chimborazo (20,548 ft)! The weather was still not very good today, so we didn’t expect to summit, but the group worked hard and were in good spirits. We made steady progress, at each rest stop we felt good about continuing, and we went all the way. Everyone was so excited to be on top and – at the furthest point from the earth's center. Now everyone is safe and happily resting in the beautiful, semi-tropical town of Baños. We are really tired but very happy and ready to celebrate the summit. We will spend one more day here in Baños, basically having a relaxing day and making visit to some of the beautiful waterfalls around this area. It's been a great experience together. Thanks for following our adventure! We just wanted to give you a quick update from our trip. I think last time we spoke, we were at the hacienda after climbing Cayambe. Since then we made an attempt on Antisana. We had beautiful views of the mountains from the camp. The night was clear to start off with, but then the weather came in towards the summit, so we were not able to reach the summit. But we all agreed it was for the best. We were still able to climb to about 5200 meters (17,061 feet), so it was a very good climb. We are now on our way to the Chimborazo hut. The weather is still cloudy, but we are hoping for a good break on Chimborazo so we can attempt the summit. Hello, this is Kirsty from the Ecuador Volcano Expedition. We’re having a great time! Yesterday we climbed Cerro Pasochoa 4300m. Today we did Rucu Pichincha 4700m via the Paso de La Muerte, also known as the passage of death. So, we feel very equipped for any adventures we come across on the bigger mountains later. That’s all for now. We’ll check in again tomorrow. Lead guide Andy Stephen checked in. The team is still waiting at 17 Camp, taking today to rest and acclimatize wile they wait for a weather window to make their summit attempt. They checked out views from the Diving Board, ate, drank water and slept. Everyone was excited for grilled cheese for lunch and freeze dried 'delights' for dinner! The team hopes to make a summit bid either today or tomorrow! Lead guide Andy Stephen checked in from High Camp last night. They had a very windy start to the day that cleared later in the evening, with the clouds breaking, allowing the sun to shine through. There were some swirling clouds on the West Ridge, which Andy noted is one of the coolest features on he route. The team did a great job and will be resting tomorrow, taking the opportunity to snap some classic photos on the Diving Board which is a cool feature right outside of camp. Team 6 guide Wyatt Evenson called in. The team had a large amount of snowfall, accumulating about two and a half feet, on Friday night at Camp 2. Due to the snowfall and cloudy weather they decided not to back carry early in the morning. Once the weather cleared enough later in the day, around 1:00pm, they were able to make the trip down to retrieve their cache at around 10,000ft. The team took a weather day on Camp two (aka Camp Misery as Wyatt endearingly referred to it) the next day, making a trip to Windy Corner to stash their cache at 13,400ft. Richard made an awesome dinner of rehydrated peppers and other delicious sides when they arrived back at camp. Everyone was able to enjoy the beautiful view to the south of Mt. Forker, the Kahiltna Dome and many other awe-inspiring peaks through the Kahiltna pass. The plan tomorrow is to move to Camp three at 14,000ft. They will let us know as soon as they reach their next camp! Everyone on Team 6 wishes their father a happy fathers day! Lead guide Paul Ivaska called in briefly. The team unfortunately had to pack up at high camp and head down this weekend. They were unable to make a summit push due to deteriorating weather. Everyone made it down to Camp 3 successfully, and then to basecamp. Team 5 guide Eric Shaw checked in from 14,000' Camp! Yesterday the team got a cold and early start around 7am. They spent the first several hours climbing in the shade in single digit temperatures. They were fortunate enough to catch the sunrise over the West Buttress just as they reached the fixed lines. This made the rest of the day much more bearable for the team during their crossing of the Bergschrund and climbing to their cache around 16,000ft. Regardless it was a hard day! Eric stated that as usual Team 5 rose to the challenge and everyone was at Camp in great time at 2pm. The weather looks positive and the team hopes to make a push for High Camp today, and weather permitting, for a summit attempt this weekend! Team 6 guide Wyatt Evenson called in. They have made it to Camp 2! The team had left their previous camp at 5am that morning, and were ready to go after a good move day breakfast of granola and breakfast cookies. They arrived at Camp 2 around 12:30. Richard then cooked up a good meal of chicken, raisins and veggies to 'fend off the scurvy' as Wyatt joked. Tomorrow the plan is to do a back carry to pick up the cache they left yesterday. This will put them in position to prepare to move to 14,000 Camp. The weather is starting to deteriorate a little bit. They started off with sunny skies with a few clouds to now full on snow that is supposed to move throughout the weekend. Just shows the variety of weather in the Alaska range! Lead guide Paul Ivaska called in. Team 4 is still at High Camp waiting for a weather window. It has been too windy and cold to make an attempt for the summit, but they hope to have a clear window tomorrow. Tomorrow will be their last opportunity to make a push for the summit! Lets send them our best wishes! Team 6 guide Wyatt Evenson called in. The team is at Camp 1, having successfully cached just below Camp 2 today (around 10,000ft). The warm temperatures made them a little slow coming back, but they were sill able to accomplish their goal in around 6 and a half hours. Wyatt cooked everyone up a dinner of pasta and pesto, and finished up with some cookies. It was a big day, especially with the teams first big haul having to carry a majority of their food, so everyone is pretty tired. The plan is to get some sleep tonight and make the climb to Camp 2 tomorrow. They hope to arrive by mid evening. Guide Paul Ivaska called in at 1:30 on Wednesday. The team is still at high camp. There was a large amount of evident snow transport that signified strong winds, so the team made the decision to stay an extra day at high camp. The plan at this point is to wait for a clearing in the weather to make a push for the summit. Alex called late on Tuesday to report that they didn't summit Antisana because there was so much new snow and some avalanche danger higher up on the mountains. There usually aren't any or many climbers on the mountain when we climb Antisana, but yesterday there were a lot. Alex said the other climbing teams all began their climb an hour before Diego and he set out, but they were ahead of everyone in less than two hours. Alex said, "I guess we are more fit than we realized." It sounds like they were sprinting up the mountain! They decided to turn back at a point somewhere over 17,000 feet, and the other groups followed their decision. Alex said, "There was far more snow than we expected. From the precipitation we had the day before, we thought there would be some new snow, but there was a surprisingly big accumulation. Diego says it is totally unusual for this time of year. We were punching through pretty deep." Before signing off he said the skies were clear and the winds were about 35 mph. They checked the weather report, and it looked like their best window for Chimborazo would be Wednesday. Alex called again today (Wednesday, June 14) to say they had changed their plans. "We are doing fine, but the weather forecast for Chimborazo is terrible for the summit attempt days, so we decided to change our plan and instead climb Illiniza Norte. The weather at Chimborazo was predicted as rain for a few days, but last night the forecasters changed it to snow. That's good for the glaciers but not for our ascent! The weather around Illiniza Norte is supposed to be better, so we'll see what we find there and make the most of it." "We spent yesterday in beautiful Baños, enjoying the semi tropical surroundings and visiting a beautiful waterfall. Pretty different from where we have been climbing! We spent the night in Baños last night and have just arrived at the base of Illiniza Norte. We will camp tonight and make the summit attempt tomorrow. We will call you again once we are back in Quito. We're having a great time, and that's the main news for now." Team 5 guide Andy Stephen checked in on June 12th. The team had a successful day retrieving their cache at 13,200ft after enjoying a delicious breakfast of eggs and bacon. Camp was filled with swirling clouds and light fluffy snow They practiced fixed lines in the evening in preparation for moving farther up the mountain. They had a calorie rich lunch of Cheesy bread and an equally rich dinner of Shandy Mac Supreme. The plan for tomorrow is to put up a cache after the fixed lines at 16,000ft. Tomorrow is forecasted to be a beautiful day in the Alaska Range! 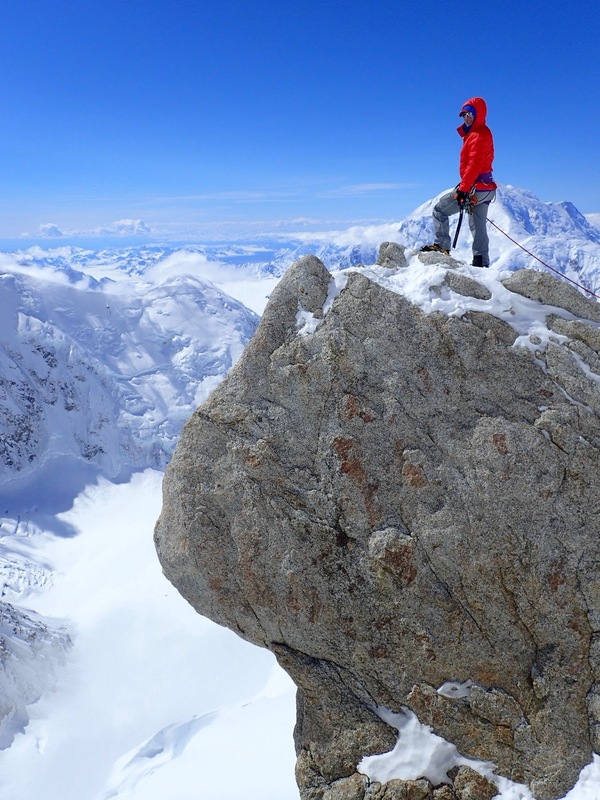 Denali Team 6 guide Wyatt Evenson called in from Basecamp, giving the last first dispatch of the season! The team flew in yesterday around 3:00pm and kicked off the evening with a delicious dinner of veggie burgers with a side of pringles and salad. Everyone was able to get a good nights rest and had a great start to the morning with a breakfast of bacon and eggs, just the protein needed to start their journey up the mountain. Today will be a training day reviewing crevasse rescue and sled rigging. The team will be on a night schedule and will start walking tonight, with their first objective to get down to Heartbreak hill around 2:00am. They will then take a right turn on the Kahiltna and make their way to Camp 1. There are a few heavy hearts and some frowny faces as Wyatt noted...probably due to the night schedule...but he is confident he can turn those into smiles within the day. Diego and Alex called to give us updates on their private Cayambe + Antisana + Chimborazo climbing program. We spoke with both Diego and Alexander, and they sound like they are having a great time together. Yesterday they did their first acclimatization hike on Cerro Pasachoa, and Alexander said he has no issues with the peak’s 13,776-foot altitude. 1) Diego won't let him eat a guinea pig until the last day because he doesn't want Alex to get sick during the trip [this is a joke because we have never known anyone to get sick on this dish which is always referred to as the “local delicacy”]. 2) They don't have sugar-free red bull, so Alex has been on a sugar high for the last three days. 3) They have apple flavored Gatorade in Ecuador - which Alexander has declared “my favorite souvenir so far!” He plans to bring some home, we think as a bit of a status symbol. They called again just after coming off of Cayambe to report that they had successfully reached the summit! Alex was feeling so good at altitude that he skipped the extra day built into the itinerary for further acclimatization. He went from sea level to 19,000 ft in four days and felt quite good. He says it must be at least partly due to Diego being a great guy to climb with (!) but also added that it really helped to do the warm-up climb 15,413-foot Rucu Pichincha. Before and after the climb they stayed at beautiful the Hacienda Guachala and Friday night they were planning to stay at a different hacienda closer to Antisana, their next objective. Saturday the plan was to go to the base camp of Antisana and then begin their ascent that night at about midnight. It rained a little Thursday afternoon, so they were expecting at least a little new snow on the route. As a final note, Diego said it’s been pretty windy over the last week or so but seems to be getting back to a more normal pattern. He said the last few days have been totally calm, so they are hoping for good weather on Antisana. Lead guide Andy Stephen checked in. Team 5 was hunkered down at Camp 2, taking another rest day, due to high winds and a wintry mix of precipitation. Andy said the team is just excited to be in the big mountains, and the day was spent eating, sleeping and joking around. They were hoping for better weather tomorrow morning, which is predicted to be nicer, that will allow them to get a cache in at 13,000ft. Guide and 'chef' Shaw conjured up a delicious dinner of beans and naan for the team. Today Team 5 was "able to get out of the swampy, soupy and warm weather of Camp 2" at 11,200ft and get their cache in at 13,200ft. Andy stated the climb up to that elevation was exciting, full of weather, wind and cheese. Everyone is excited to have made it higher and can't wait to make another push to Camp 4 tomorrow. Dinner is provided courtesy of Chef shandy, who is cooking up a fine meal of burritos with salsa. They send their best wishes and hope that we are having just as good a time following along as they are on beautiful Denali! Lead guide Andrew Yasso called in from relatively sunny Talkeetna! They left camp 3 the previous day at 14,000ft at 11pm the and made it into basecamp at around 10-11am in the morning, a solid 12 hour move. Andrew had mentioned different 'e' words in his previous dispatch, but to describe the final push down to basecamp he used the word 'eventful'. With difficult travel, open crevasses and other challenges everyone still worked hard, stayed together as a team and managed all events with a laugh and a smile. Solid teamwork! The team is now letting their gear dry out in Talkeetna, happy to be back and looking forward to a shower and one of their last team dinners together. Thanks for following everyone! Lead guide Andy Stephen checked in. Team 5 is having a snow day at Camp 2 and enjoying a breakfast of pancakes and sausage. The team will spend the day improving camp, going through snow school and will be spending time preparing for their continual push up the mountain. They are hoping to cache as soon as possible but it depends on what the weather brings over the next day or so. Tonight 'Mike McChef' will be cooking up a meal of dunkaroos parmesan (Thats even a mystery to us at the office!) but it will have plenty of cheese and good calories to fuel the team for their climb. At this point everyone is excited to return to a normal sleeping pattern. The team is at 17,200ft taking another rest day. The high winds and cold temperatures earlier this morning required that the team stay put for today. The weather cleared later in the day and temperatures rose around 2:30pm allowing for some movement and activity around camp. Andrew has said that their slow and careful ascent and team work has really paid off, and that he is incredibly proud of how well the team has handled their journey up to 17,200ft. Not taking the phrase lightly, Andrew has said everyone is in incredibly good spirits, as you can probably tell from the relayed dispatch introduction. With one more day tomorrow they hope to make the final push to the summit. Lead guide Andrew Yasso called in from High Camp (17,000ft). They woke up to high winds that unfortunately hindered the team from pushing forward. They were able to utilize the additional time to maintain and reinforce their camp or 'fortress'. The team is trying to stay active to help with their acclimatization by moving around camp and prepping for the next few days. They have plenty of food for the next several days and are hoping to find a weather clearing to leave High Camp and move forward. Lead guide Paul Ivaska called in...The team made it to Camp 3 at 14,200ft. The weather yesterday morning was looking unfavorable but a small window allowed them to make the push from Camp 2 to Camp 3 successfully. They arrived at camp late but the team did very well setting up camp. They had dinner and went to bed late, but everyone was able to have a leisurely start the following morning with a good breakfast of pancakes and sausage. The team will go pick up their cache at 13,500ft today. Tomorrow the plan is to practice some fixed lines and get their high camp meals organized. Afterwards the team will wait for a weather window to put their cache in at 16,000ft. "Hi, this is Andy from AAI Denali Team 5, writing in to report our progress- we arrived at Camp 1 (7,800ft) this morning after flying into Base Camp (7,300ft) yesterday afternoon. The weather for the move was great, and the team did really well. We ate sandwiches from a local Talkeetna restaurant for dinner. Tomorrow we will sleep through the day and put in a cache at 10,000 ft tomorrow night if the weather holds." Lead guide Andrew Yasso called this morning. Team 3 is making their way to High Camp (17,300ft) right now. They have a small weather window and are looking to make their summit attempt on Tuesday! They have about 3 days worth of food in case they need to wait out some weather. Very exciting for his team and as Andrew said "this what we all came here for". Let's wish them all luck and hope we hear good news in the coming day. The first post from Team 5 is a good one! They are in the air and made it to Kahiltna Base Camp (7,300ft). We look forward to hearing from them more throughout their expedition. Here is a photo of the team outside K2 Aviation in Talkeetna, AK. Team 3 has cached above the fixed lines (16,200ft) and is back at Camp 3 (14,200ft). The team is enjoying a rest day today and eating some good food before they make their move to High Camp (17,300ft). Winds are pretty strong up high but are likely to subside by Monday. Team 4 has made it to Camp 2 (11,200ft). They will "back carry" today (pick up their cache they left at 10,000ft). After that, the team will make their cache near Windy Corner (13,500ft) and. Everyone is doing well and is in high spirits with that good weather. Team 4 has successfully cached below Camp 2 (10,000ft). The weather has been spectacular on the lower mountain which has made move days very comfortable and not too cold. The team is moving to Camp 2 (11,200ft) today and will make their cache plans for Windy Corner and moving to Camp 3 (14,200ft). Team 3 enjoyed a beautiful day at 14 Camp/Camp 3 (14,200ft). The plan is to make a trip up the fixed lines tomorrow and cache around 16,200ft. AAI guides also gave everyone a fun treat of visiting the "Edge of the World". An incredible view point and 7,000ft drop from the spot. AAI Climber Anya Jones passed along this photo to her husband David and sent it to AAI. Someone will be updating their profile photo. Lead guide Chad Cochran messaged us saying that Team 2 has summited! They are packing up at High Camp (17,300ft) and will be making their way to a lower camp and then out to the airstrip. Congrats to the team! Fredy emailed his last dispatch for this trip shortly after their return from Chimborazo. On Saturday, May 30th, we started our day by having a delicious breakfast at La Estacion Urbina, a hostel located on the eastern flank of Chimborazo. At 9am, we started our journey by loading the truck and driving to the Chimborazo basecamp. Fredy called to give us recap on the program through their successful ascent of Antisana. We’ve been having a good time together as we have hiked and climbed through a variety of conditions. Everyone is doing fine and I know each person has been enjoying Ecuador a lot. We had a good day on our first acclimatization hike on Cerro Pasochoa, at 13,776 feet. Each climber on our team did an awesome job up there, despite that being their first day over 10,000 feet. They were feeling good and strong, and I only took us two hours and twenty minutes to gain the 1,876 feet required to summit to summit this great little mountain. Once on the summit, we enjoyed lunch and the great views of all the nearby and not-so-nearby high summits. We took some good photos and then headed down. I have to tell you, Patrick, Jason, Helen and Stefan didn't even sweat on this climb. I was impressed! They were great. We did another warm up climb on Rucu Pichincha, at 15,400 feet and then headed on to Hacienda Guachala below our first big peak, 18,996-foot Cayambe. Everyone enjoyed being at the hacienda and appreciate the good food. The next day we drove to the hut below Cayambe. The weather was kind of tough there – very windy. We decided to give the climb a try and just see how far we could get, and we made it to a little over 17,000 feet. Unfortunately the wind was remaining high, and is was hard to stand up with some of the gusts, so of course we decided to call 17,000 feet a perfect place to turn around and head back to the hut! I know the team members were proud of what they were able to accomplish under challenging conditions. Each person was so motivated despite the weather. I was very impressed! We stayed at Hacienda Guachala before and after the Cayambe climb and then another hacienda in the Antisana Reserve area. We had an easy day to rest up from Cayambe and get ready for Antisana. We received a later call that was hard to understand because of poor transmission, but the news was that the team had summited the 18,891-foot Antisana, had descended the mountain, and was heading for the town of Ambato. The team was looking forward to another good rest before heading on to attempt Chimborazo. We drove up to the Carrel hut at 15,748 feet and hiked about 30 minutes to the Whimper hut at 16,404 feet. Everyone was feeling well rested, well acclimatized, and highly motivated for the climb ahead. The next day, Sunday, May 31st, we started our climb at midnight. After preparing our gear, we began our climb towards the Castle Ridge at 18,000 feet. When we reached the Castle Ridge one of our team members started to feel the altitude, and we decided to split the rope teams to allow the stronger climbers to keep climbing. At 7am in the morning, we reached Veintimilla summit at 20,561 feet, and the wind started to blow harder. One climber decided to stay on the Veintimilla summit instead of pursuing the Whymper summit, because of the high winds. So then two of us made the trek across the huge summit plateau to the highest summit of Chimborazo, the Whimper summit, at 20,702 feet. The crossing wasn't too difficult, and we reached the summit by 8am. We celebrated our successful climb, took some pictures, returned to the Ventilmilla summit, and the headed down to the hut. After some more to eat at the hut and a little rest, we hiked down to our vehicle and then drove across Ecuador's central valley (between the two parallel rows of Andean peaks) and then dropped off the eastern side and descended to the semi-tropical town of Baños. Baños is a charming town located in a tropical forest area that provides an ideal place to rest and relax after our climbs. All our climbing team members were incredibly happy and content about our very successful trip. We've had a great time on the peaks down here over the last two weeks, and we hope to climb together again in the future! That's all the news for now. Thanks for following our climbing trip in the high Andes! Team 3 has made it to Camp 3 (14,200ft). They had perfect weather after a rough start but now are in good to position to wrap this expedition up in style. The team made a very strong move after caching at Windy Corner (13,500ft) and then moving to 14 Camp the next day. Great work! They will retrieve their cache today and start thinking about a High Camp cache strategy. Chad Cochran sent an inReach message last night reporting that Team 2 has made it to High Camp (17,300ft) and could very well be going for the summit right now! Hope to hear from them again tonight with good news. We will keep you posted as the day goes along. Lead guide Paul Ivaska called in this morning. Very sorry for the delay in dispatches for Team 4. The team was delayed a few days flying into Base Camp and there have been some SAT phone issues in getting calls to AAI. But those have been resolved and they will be checking in daily from here on out. Paul called to report that the team has made it to Camp 1 (7,800ft) and are looking to put in a cache around 10,000ft below Camp 2 today. Everyone is doing well and finished a delicious dinner. The weather in the Range is improving after a rocky May.